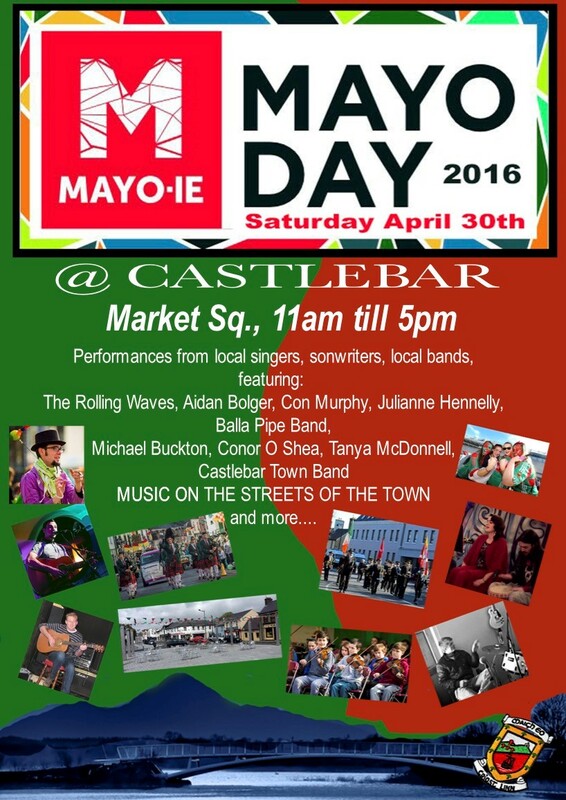 Saturday, April 30th , sees the second annual International Mayo Day. Communities from all over the county, the country and indeed the world will fly the green and red that day in honour of their "Mayoness" and show all that is great about their progressive, can-do County. On that day in Castlebar, there will be music on the streets throughout the day with a performance area on Market Square where local groups like the Town Band, Balla Pipe Band, etc. will perform. There will be singers and musicians such as Con Murphy, Conor O Shea, Michael Buckton, Julianne Hennelly, Tanya McDonnell, Aidan Bolger joining in too. Traditional musicians from the Rolling Waves group will take to the stage also. The Pink Ribbon Cycle will take place that same day. The day before, Friday April 30th, will see the local national schools take over the town to formally announce the arrival of Mayo Day 2016 with a "Green & Red Parade". The schools and their bands will march through the streets flying the county colours with pride. The parade will leave Chapel St. at 11am and we encourage the people of the town to come out and give a big green and red cheer to the children. In locations outside the county, including Galway, Manchester, Yorkshire, New York, Toronto, networks and associations are planning events and activities that celebrates who they are and where they come from. Last year, the Niagara Falls lit up for a period on Saturday evening. The following day, Sunday May 1st, Mayo County Council will hold their official 1916 Commemoration on The Mall in Castlebar and this will include a parade and a family fun day. This will coincide with the Ladies Mini Marathon.